Ewing's tumor, primarily a bony lesion, has classically been studied under the heading of small, round cell tumors. The mean age of occurrence is between the first and the second decades in 80% of cases. Extraosseous Ewing's tumor is a rare entity. 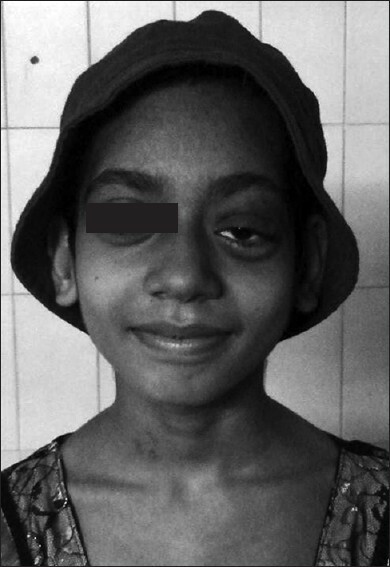 We report a young girl presenting with features of painless proptosis of the left eye without significant visual deterioration. Her radiology revealed an intraorbital, extraconal tumor with intracranial, extradural extension that was compressing bilateral frontal lobes. Total excision of the intraorbital and intracranial part of the tumor brought about substantial relief in her proptosis. This study focuses on the clinicoradiological presentation and management principles of this rare manifestation of the disease that unilaterally infiltrated into the extraconal space of the orbit as well as the bifrontal, extradural plane. 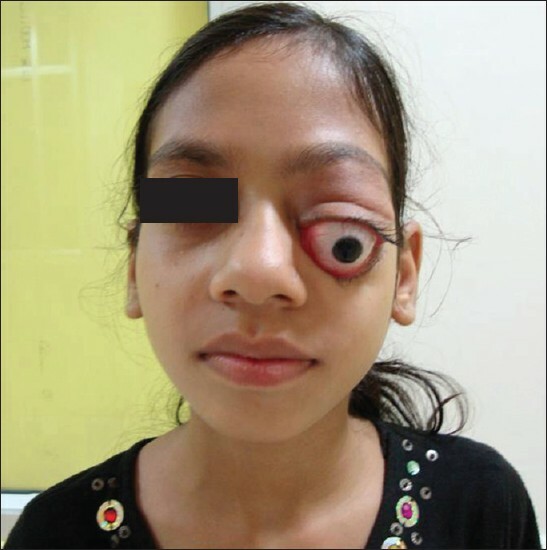 A 13-year-old girl presented with features of painless, progressively increasing proptosis of 3 months duration [Figure 1]. There was no associated loss of vision, headache or vomiting. She also noticed a firm, palpable, non-tender left inguinal lymph node that appeared at approximately the same time. Its biopsy, however, was inconclusive. Her examination revealed a left-sided proptosis with restriction of extraocular movements. Her bilateral visual acuity was 6/9. Her fundoscopic examination revealed left optic disc hyperemia. She had generalized lymphadenopathy with enlargement of cervical, inguinal, axillary and epitrochlear lymph nodes. Her abdominal examination revealed splenomegaly. Fine needle aspiration cytology of the orbital lesion revealed a small, round cell tumor. Her hematological analysis was within normal limits. Her computed tomography (CT) scan revealed an extraconal lesion in the left orbit, which was pushing the globe laterally and inferiorly. The lesion had calcific speckles within it. It had also infiltrated extradurally along the anterior skull base and was causing bilateral frontal lobe compression [[Figure 2]a and b]. There was distortion of the gray-white matter interface, with splaying of the frontal horns. Her magnetic resonance imaging (MRI) revealed a T1- and T2-isointense lesion with homogenous contrast enhancement in the left orbit and with bifrontal, extradural extension [[Figure 2]c and d]. The rapid progression of proptosis necessitated an early surgery. The girl, therefore, underwent a bifrontal craniotomy and a brownish-black tumor was encountered compressing the dura covering both the frontal lobes from the extradural aspect. It had a dumbbell shape, confirming to the shape of both anterior cranial fossae, with narrowing in the midline at the firm attachment of the dura to the crista galli. The tumor was firm, partly suckable, mildly vascular and was completely excised. The left orbital roof was thinned out at multiple places. It was removed and the intraorbital, extraconal part of the tumor also excised [[Figure 3]a and b]. The histopathological examination revealed a characteristic round cell malignancy with a highly cellular tumor arranged in sheets with formation of nodules. The tumor cells were round to oval, having mildly anisomorphic round nuclei, dispersed chromatin, inconspicuous nucleoli and scant cytoplasm. Increased mitotic activity was identified. On immunohistochemistry, there was positivity for CD99 and neuron-specific enolase (NSE). The lesion was negative for synaptophysin and leukocyte common antigen (LCA) [[Figure 4]a-c]. Postoperatively, there was no visual deterioration and the proptosis partially subsided. She was referred for chemoradiotherapy. She received a total of 55 Gy radiotherapy divided into 180 cGy per fraction, once a day, five times a week. Along with this, she also received a course of VAC regime (vincristine, actinomycin D and cyclophosphamide) with doxorubicin. At a follow-up of 3 months, the proptosis had substantially subsided and the extraocular movements of the left eye had also recovered [Figure 5]. According to Sabharwal et al., the usual distance from the lateral orbital rim to the corneal apex is approximately 16-21 mm; if it exceeds 22 mm, it is defined as proptosis. An asymmetry of more than 2 mm between the two eyes also comes under the inclusion criteria of proptosis. Radiologically, all patients with globe protrusions greater than 21 mm anterior to the interzygomatic line on axial scans at the level of the lens are considered to have proptosis. In our patient, the distance from the lateral orbital rim to the corneal apex was approximately 24 mm in the left eye and there was an asymmetry of more than 2 mm between both the eyes, confirming the presence of significant proptosis of the left eye. The globe was pushed downward and outward, pointing towards a superiorly placed lesion producing the compression. As our patient had no restriction of eye movements, an extraconal, orbital pathology was to be sought. Considering the age of the patient, absence of any febrile episodes, short duration, rapid progression of symptoms and nonpulsatile nature of the proptosis, a diagnosis of orbital malignancy was made. Fine needle aspiration cytology suggested a round cell malignancy. The rapidity of progression of proptosis and the onset of visual deterioration mandated an early surgical decompression. The histological features present in our patient were common to that seen in other small, round cell tumors of neuroectodermal origin, such as malignant lymphoma, neuroblastoma, and rhabdomyosarcoma, and therefore, cytochemical and immunohistochemical studies were important for establishing an accurate diagnosis. , In Ewing's sarcoma, the most consistent finding in immunohistochemistry is positivity for vimentin. The tumor cells usually contain large amount of cytoplasmic glycogen as demonstrated by periodic acid-Schiff stain with diastase control or by electron microscopy. Ewing's sarcoma tests negative for LCA, chromogranins A and B and osteonectin. , The detection of monoclonal antibodies to the fusion gene product, termed as CD 99 (MIC-2), is also contributory to the diagnosis of Ewing's sarcoma. Identification of the characteristic t(11;22) chromosomal translocation and the resulting EWS-FL11 gene fusion has also had a considerable implication on its diagnosis. Molecular diagnosis using fluorescent in situ hybridization (FISH) to detect the fusion gene and reverse transcriptase-polymerase chain reaction (RT-PCR) to detect its transcript is now a routine part of the examination. Our patient responded well to the combined regimen of surgery with chemoradiotherapy (radiation with the VAC regime and doxorubicin). Other chemotherapeutic agents like ifosfamide and etoposide have also shown promising results. Treatment of Ewing's sarcoma with a combination of surgery, chemotherapy and radiation therapy results in a 5-year survival rate of approximately 65%. , According to Esiashvili and colleagues, the 5-year survival of localized disease increased from 44 to 68% in the period after 1993, whereas 5-year survival of metastatic disease increased from 16 to 39%. The corresponding 10-year survival increased from 39 to 63% for localized disease and from 16 to 32% for metastatic Ewing's sarcoma. With appropriate and timely intervention, there is a high expectation of improvement in the quality of life as well as life expectancy in this young population of patients suffering from this rare malignancy. Ewing's sarcoma in the pediatric age group that presents as proptosis with significant intracranial extension compressing both frontal lobes is an extremely rare manifestation of the disease. However, with appropriate management, there is likelihood of an excellent response, both in terms of survival as well as an improved quality of life. 1. Esiashvili N, Goodman M, Marcus RB Jr. Changes in incidence and survival of Ewing sarcoma patients over the past 3 decades: Surveillance Epidemiology and End Results data. J Pediatr Hematol Oncol 2008;30:425-30. 2. Arndt CA, Crist WM. Common musculoskeletal tumors of childhood and adolescence. N Engl J Med 1999;29:341-52. 3. Kennedy JG, Eustace S, Caulfield R, Fennelly DJ, Hurson B, O'Rourke KS. Extraskeletal Ewing's sarcoma: A case report and review of the literature. Spine (Phila Pa 1976) 2000;25:1996-9. 4. Dutton JJ, Rose JG Jr, DeBacker CM, Gayre G. Orbital Ewing's sarcoma of the orbit. Ophthal Plast Reconstr Surg 2000;16:292-300. 5. Sabharwal K, Chouhan A, Jain S. CT evaluation of proptosis. Indian J Radiol Imaging 2006;16:683-8. 6. Margo CE, Mulla ZD. Malignant tumors of the orbit. Analysis of the Florida Cancer Registry. Ophthalmology 1998;105:185-90. 7. Reese AB. Expanding lesions of the orbit. Trans Ophthalmol Soc U K 1971;91:85-104. 8. Shields JA, Bakewell B, Augsburger JJ, Flanagan JC. Classification and incidence of space-occupying lesions of the orbit. A survey of 645 biopsies. Arch Ophthalmol 1984;102:1606-11. 9. Choi RY, Lucarelli MJ, Imesch PD, Hafez GR, Albert DM, Dortzbach RK. Primary orbital Ewing sarcoma in a middle-aged woman. Arch Ophthalmol 1999;117:535-7. 10. Basit Ali Syed. Primary intracranial ewings sarcoma of calvarium presenting as acute neurosurgical emergency. Case report and literature Review. Pan Arab J Neurosurg 1999;3:1. 11. Bhatoe HS, Deshpande GU. Primary cranial Ewing's sarcoma. Br J Neurosurg 1998;12:165-9. 12. Alvarez-Berdecia A, Schut L, Bruce DA. 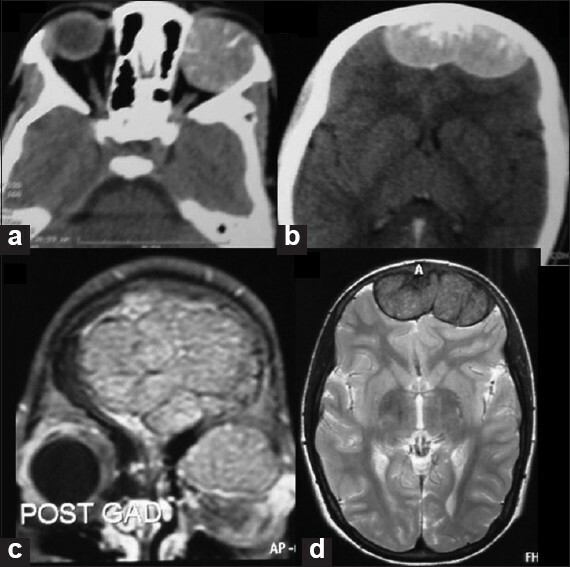 Localized primary intracranial Ewing's sarcoma of the orbital roof. Case report. J Neurosurg 1979;50:811-3. 13. Gupta N, Bansal D, Saxena AK, Srinivasan R, Marwaha RK. Primary orbital Ewing's sarcoma presenting with unilateral proptosis. Cytopathology 2008;19:124-6. 14. Lam DS, Li CK, Cheng LL, Teo JG, Chik KW, Kwan WH, et al. Primary orbital Ewing's sarcoma: Report of a case and review of the literature. Eye (Lond) 1999;13:38-42. 15. Perlman EJ, Dickman PS, Askin FB, Grier HE, Miser JS, Link MP. Ewing's sarcoma--routine diagnostic utilization of MIC2 analysis: A Pediatric Oncology Group/Children's Cancer Group Intergroup Study. Hum Pathol 1994;25:304-7. 16. Roessner A, Jürgens H. Round cell tumours of bone. Pathol Res Pract 1993;189:111-36. 17. Sharma A, Garg A, Mishra NK, Gaikwad SB, Sharma MC, Gupta V, et al. Primary Ewing's sarcoma of the sphenoid bone with unusual imaging features: A case report. Clin Neurol Neurosurg 2005;107:528-31. 18. Guzowski M, Tumuluri K, Walker DM, Maloof A. Primary orbital Ewing sarcoma in a middle-aged man. Ophthal Plast Reconstr Surg 2005;21:449-51.